One day before the explosion in 1984, Union Carbide were the friendly guys who brought you the Eveready brand and the Cat with 9 Lives. The NPS would have been pretty good. And pretty useless at measuring the forgivability, or lack of forgivability of the once proud Union Carbide name. Most organisational and market research measures – the KPIs – are readings of static concepts rather than of processes. Here’s another measure: Staff satisfaction. It may be high, it may be low, but the score itself says little of any predictive use. Thus everybody might be deliriously happy at work (and I hope they are,) but we have no idea from the happiness Index whether they’ll stay happy once the take-over goes through, or when the job cuts are announced. In fact the measure is pretty useless. It is a thermometer when really it might be more predictive to have some kind of staff barometer which hints at soft or deep changes immediately ahead. Now brands are measured along similarly useless lines. They’re measured statically but not predictively. We measure the status of the brand, but that gives no feel for whether it is heading toward a cliff; or whether it would survive the fall, even if it did. When we judge the people around us, we don’t just stop at “he’s a great guy” or “she’s 5 foot 11,” or “she’s a real leader,” we almost always add what I refer to as the moral dimension. “He’s a great guy…BUT I wouldn’t trust him with my money, or “She’s a real leader …AND did you see the way she showed so much respect, even to the people she had to make redundant.” In other words we don’t just settle for today’s status update, we also tend to throw in the prognosis of how that person will act if they’re put in a conflicted, morally challenging position. We have a “Moral Vocab” with which we assess the likely behaviours of those we judge. Great guy – but morally iffy. Great leader, and puts people first no matter what. The star term, I reckon, in this Moral Vocabulary is forgivability. It is a useful concept because it accepts that all people will fail at some point, or that all organisations will have their crisis and every brand will have its “New Coke”/”Ford Edsel” moment. They’re bound to. Forgivability measures how people will respond if and when that crisis occurs. In terms of the resilience of the brand, or the company, the real test is not how you rate when everything goes according the plan – but how quickly you can bounce back if you falter. To take an obvious case, Tiger Woods was the undisputed star of the golfing world (and still the highest paid athlete in 2013 despite not winning a major tournament.) A typical brand measure, up to the point of his personal and media scandal, would have given him stellar results on, say, an NPS scorecard, or on any other brand index I can think of. But look how quickly that turned. The moment Woods fell to earth in December 2009 (or should I say, the moment he ran his SUV into a fire hydrant), everything changed. The tank of public goodwill suddenly showed “Less than half full” and sponsors started to walk away. Suddenly the values we valued in this amazing sportsman were reframed and seen in new light. Determination? Or simply arrogance? Success? Or just runaway greed? Perfection? Or just a sham facade? Everything that a brand measure might have rated as superb one day was shattered within 24 hours. Four years later forgiveness has largely occurred. The gallery is generous once more when he makes a great shot, and descriptions of this golfer are laced more with qualifications about his pay check or his climb back to form, than they are about who he has a personal relationship with. Organisations can rate well in terms of forgivability, or they can rate poorly. It depends, as it did for Tiger Woods, on the seriousness of the sin and the forgiveability of the sinner. In my view, Tiger Woods forgivability was undermined by the woeful stage-managed response by his sponsors. Remember those bleak Nike ads where a voice over (supposedly Tiger’s own dad) remonstrated mournfully with our hero? These attempted to package the redemption of Tiger Woods into the space of a 30 second TVC. The ads assumed that with a quick show of humility we’d be swift to forgive the golfing superstar. Instead the ads gave us evidence that Woods – he behaved not a man but as a marketing juggernaut – was attempting to media-manage his way out of his mess. It looked merely like insincere spin doctoring. Another sin! And so for weeks the Woods machine kept heaping more fuel onto the fire. But what of your organisation? It may be sailing along – the speedomoter is reading high, the thermometer reading nice and warm, but what if it made a blunder? It will happen. How will your stakeholders or customers respond? Apple, that golden child of the business media, has a string of business and product blunders a mile long. But was it forgivable? Absolutely. Why? Because the products are cool and because Steve Jobs never really deviated from his vision. The public understood his quest and knew that some failures will litter the pathway to success. No problem. Some sins are purely business as normal. Coke really did believe their New Coke formula was a better, more preferred option. They didn’t think things through. But some sins are simply not forgivable. Union Carbide, that industrial fortress of a company that made Eveready Batteries, and Pesticides and Glad Wrap, was responsible for one of the worst industrial accidents in human history with the Bhopal disaster in India, back in December 1984. Here was a company that was deliberately trading-off the cost of safety in order to boost profits from its poorly resourced pesticide plant located in a heavily populated area. As a result of an MIC gas explosion an estimated 40,000 individuals were either permanently disabled, maimed, or suffering from serious illness. That was bad enough. But then after the disaster, Union Carbide tried overtly to avoid culpability or to pay any compensation to the families of the accidents thousands of victims. There was no mea culpa – instead the company fought a legal battle before finally being sued by the Indian Government for US$470 million, 5 years after the disaster. The guts of their defense was was that they weren’t responsible as a company for Bhopal – it was the fault of their employees in India. It was a massive squirm. 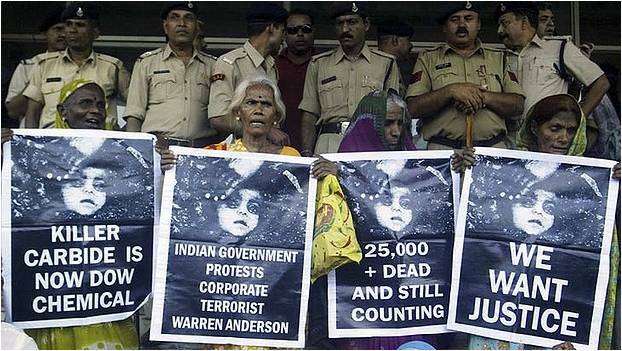 The head of the company Warren Anderson was never brought to justice in India after the American fled India while on bail, and has since fought extradition from the USA. Today the company no longer owning its flagship brand (Eveready) and is part of the Dow Chemical company who have inherited the mess. In 2010 (25 years after the disaster) eight former executives of Union Carbide India Ltd. were finally found guilty of death by negligence. Dow, themselves burnished by the reputation of their own history with Napalm and Agent Orange are still assisting with the highly toxic Bhopal site cleanup. Mistakes, blunders and sins can be made by any organisation. But how soon can these organisations recover – how soon can they be forgiven? In a dynamic world researchers need to measure these things. In my next blog I’m going to dissect the elements of forgivability. Get it wrong and your organisation will tread an unnecessarily risky path. All we need to think about is “The Secret Life of Walter Mitty”. It is a classic and sums up the whole situation. I don’t play golf, so I can’t relate to Tiger Woods – but how is Tiger Beer selling?